We are a locally owned, family-operated company that has been providing customized metal fencing and gate fabrication services for over 30 years. We have built a long-standing reputation in Warren, MI and the surrounding areas for providing only the highest-quality craftsmanship and superior results. We specialize in creating one-of-kind iron fences, gates and more, but can also handcraft specialty items in brass and stainless steel. You can always depend on us to use the perfect blend of artistry and craftsmanship to provide you with beautiful and long-lasting fencing and gates. 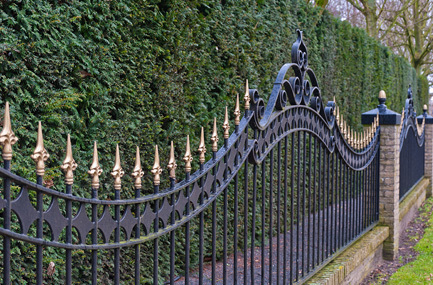 Whatever your iron fencing needs are – we can take care of it! Our company custom designs and fabricates iron fences to address our customers’ particular needs. There is an unlimited number of fencing styles you can choose from to accent your home or business. Our talented and experienced fabricators use only top-quality materials to create the fence you want for your property. We welcome any questions about our services. You can become acquainted with the professional quality of work we produce by looking at pictures of the finished results from projects we have completed for satisfied customers. Our fabrication capabilities are unmatched, and our very high standards of workmanship are displayed with every finished project. Wrought iron gates are strong and durable structures that require an experienced fabricator to ensure a perfect fit and design. Having your iron gates professionally built is one way you can personalize your property and distinguish your home from the others in your neighborhood. There is no style of gate that we can’t fabricate! You can choose from our extensive portfolio of completed projects that showcase many styles of wrought iron gates. Or, if you prefer, you can consult with one of our designers to help create a gate that will suit your unique, aesthetic tastes and enhance the appearance of your residential or business property. No matter how you decide on what type of gate you want, you will receive a finished product completed to your specifications including the color, shape, and finish of the gate. We have all the tools and experience to create the exact gate you want for your property - we guarantee it. 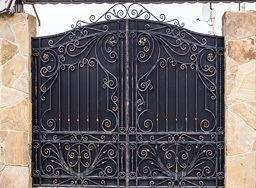 San Marino Iron is your go-to wrought iron fencing and gate manufacturer. Feel free to contact us today to arrange a free, initial consultation. One of our representatives will be happy to meet you at your property. In addition to our home city of Warren, our service area includes Detroit, Birmingham, West Bloomfield, Troy, Rochester Hills, and throughout Southeast Michigan. Contact San Marino Iron for all of your ornamental fencing and gate needs!